Discover a town at the very end of the Piranese peninsula, adorned by timeless sensational romance. A deep-rooted tradition of salt panning merges with countless stories of the narrow town streets and the picturesque sights of the Slovenian Mediterranean. 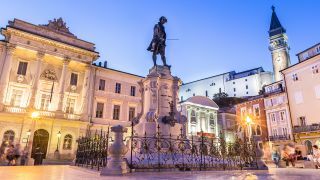 Where to stay in Piran? Refill your batteries from an exciting day of exploring the narrow town streets at one of our fantastic types of accommodation. Rich foods and an excellent selection of local wines to satisfy even the most demanding gastronome. Plan your trip in accordance with local traffic regulations. Spend your day exploring sights and attractions which give the town its heart and soul. As far as acoustics are concerned, the cloister has little competition in Slovenia. 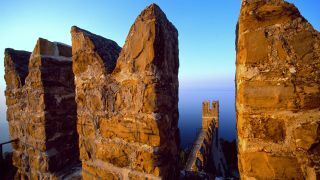 The city walls of Piran were mentioned as early as the 7th century when they were built surrounding the old city core in Punta. 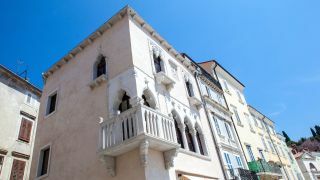 The most beautiful example of Venetian Gothic architecture in Piran. 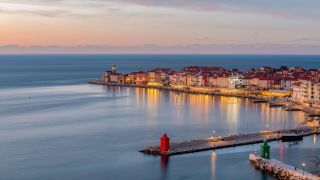 Start your day with the best cup of coffee by the sea, discover magical cultural attractions, enjoy sea waves and finish your day with a stroll through the narrow cobbled streets to one of the most beautiful views from the top of Piran's wall. 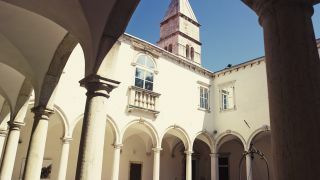 Events and performances in Piran. Plan your trip with the interactive bike trail map. Discover a small bay whose popularity grows every year among local and foreigner bathers. This medieval town, whose architecture was influenced by its proximity to Venice, is without a doubt one of the most romantic, most preserved and most authentic Mediterranean towns. The strong historical influence is complemented by the Mediterranean ambience and various cultural attractions that are mostly linked to the tradition of salt making.